Famed for a feminine yet relaxed aesthetic, French brand Nina Ricci has been creating refined collections since its launch in 1932. The iconic brand has garnered a cult following, which has come to adore the brand's sophisticated designs and flattering cuts. 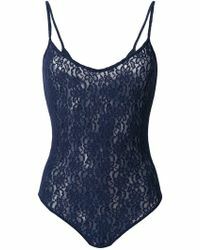 Nina Ricci lingerie is sweet yet seductive, boasting expertly crafted bra sets and camisoles in lace, velvet and tulle. Expect lace-trimmed briefs, mesh panels and pastel colour combinations. Shop this edit of Nina Ricci lingerie and create a solid foundation for your capsule closet.